At DNAnexus, we’re honored to be recognized by Frost & Sullivan as one of the most significant enabling technologies driving industry-changing innovation within the genomics community globally. Frost & Sullivan research involves extensive primary and secondary research across the entire value chain of specific products. Against the backdrop of this research, Frost & Sullivan evaluated DNAnexus on two key factors — Technology Leverage and Customer Impact — and compared DNAnexus to other industry players. 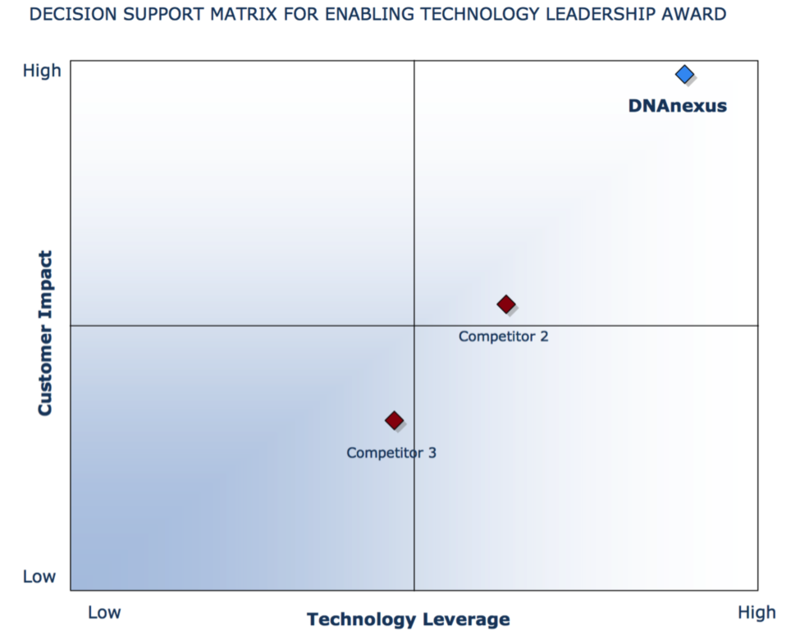 DNAnexus’ overall rating was significantly higher than the other industry players, resulting in the Best Practice recognition. As next-generation sequencing (NGS) projects take off with the goal of sequencing tens or hundreds of thousands of genomes, there is a crucial need for a solution that can handle this tremendous amount of data being produced. As DNAnexus’ own VP of Science, Andrew Carroll puts it, “Life science companies are missing a management system for dealing with petabytes of data and billions of objects. There are challenges of operating at scale – it’s not that difficult to do something that will work once or a hundred times, but when it comes to have the same system work hundreds of thousands or millions of times, there are a lot of random errors and other lower-level problems that turn out to be a big deal.” You can read more on why life sciences and genomics markets are finding cloud approaches more appealing here. These companies are in need of an efficient way to upload, store, share, and analyze the increasingly massive amounts of data being generated. At DNAnexus, we’re harnessing the power of the cloud to do just that. We are committed to innovation in this area, powering industry and academia as they continually aim to take on more genomic data. Because it’s uniquely tied to an individual, genomic data can be regarded as some of the most sensitive data collected. As organizations seek to make advancements in this field, they need to ensure the sensitivity of genomic information is preserved. DNAnexus offers layers of platform features and accreditation to support an exceptionally strong security and compliance profile. DNAnexus is continually audited and certified by an independent 3rd party for compliance with ISO 27001, an internationally recognized Information Security Management System and accompanying controls, enabling DNAnexus to address a broad range of global compliance regimes. . These include HIPAA, CAP/CLIA, GCP/GLP, dbGaP, FedRAMP, and European Data privacy laws. Frost & Sullivan acknowledges the collaborative nature of our platform as one of its key strengths. A dataset is only as good as is the ability to access it. Additionally, as sequencing projects scale, so can the number of organizations working together to draw conclusions. DNAnexus provides a network of collaborators in the genomics community the ability to share, transfer, access, integrate, and analyze this data – all securely and compliantly within the cloud. 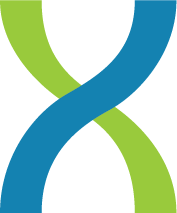 DNAnexus is the Platform of choice for leading academic core labs and consortia, including the Stanford Center for Genomics and Personalized Medicine, ENCODE, 3000 Rice Genomes Project, precisionFDA and more. Frost & Sullivan recognizes our commitment to solve some of the biggest challenges facing the field of genomics. DNAnexus, and its broad network of partners, provides pharmaceutical and biotech companies, global diagnostic test providers, genome centers, and sequencing service providers secure and compliant infrastructure and scientific support to solve today’s genomic challenges faster and more effectively than ever before. The company is the platform supporting some of the largest genomic sequencing projects in the world, such as Regeneron Genetics Center, and the underlying platform for precisionFDA, the FDA’s forward-thinking initiative to evaluate the accuracy and reproducibility of next-generation sequencing bioinformatics pipelines. We’ve been at the forefront of employing the cloud as the ideal platform for genomics and scientific computing and we’re excited to continue our work to create the global network for genomics. You can read the full Frost & Sullivan report here. Curious to see how our Platform works? Request a demo.